Hi. I’m a new “full” user, as will be obvious when reading my questions. In preparation to trying out the webUI I needed to select which lists to push. That’s when I noticed that there are two entries for “Aldi’s”, one with a star. I’m not aware that I set up two lists for “Aldi’s”. What is the meaning of the star? Hi Bill, thanks for your question. 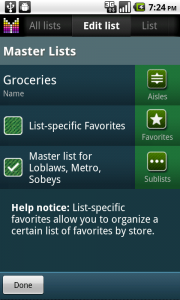 Kindly note that the list with the star is list-specific Favorites for your “Aldi’s” store. 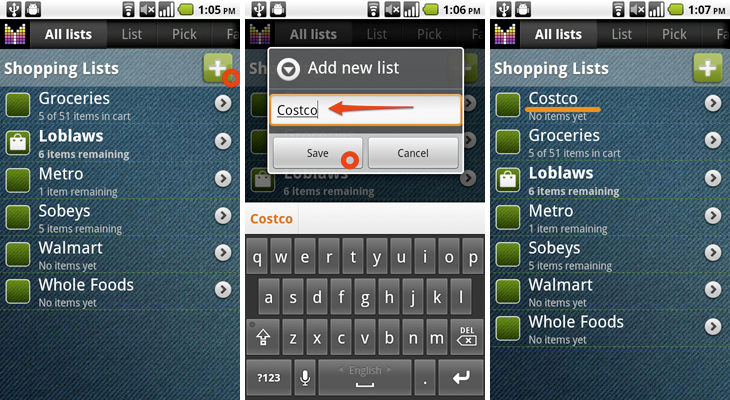 If you don’t want to sync your favorites for “Aldi’s”, just ignore the list with the star. I shop in the order of the store. I see how you can group the items by aisle but can I move the groups? Egg I start in the fruits and veggies sexton how do I get that the first group on my list. Is this possible? That would be eg; and section … sorry its late. Hi Suzy, thanks for your question. Yes, it’s possible to change order of groups (aisles). Please see Manage aisles User’s Guide for more details. I need a management that allows me to have a monthly list (supermarkets) and subordinate to it, a weekly list (grocery store). So when I went to the supermarket, I would also see the weekly list at the same time. And when I went to the grocery store, I only see the weekly list. Hi Gibran, thanks for your feedback and suggestion. You may want to try the Master list feature for your convenience. 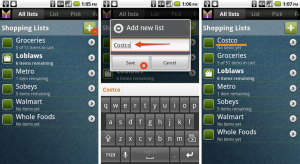 You will need to create a Master list which will aggregate your supermarkets and grocery stores. This way all your items will be listed under Master list but you still can have store-specific listing by choosing store’s list. The Notes display option is not working in the lite version on my Galaxy Tab. Always shows the yellow triangle when flagged to show comments. Great app – dropped “Out of Milk” because of the way you use pricing. Hi Shawn, thank you so much for your feedback and your question. Could you please confirm that “Show full comments” option is ON in Menu –> Settings –> Options? Thanks. 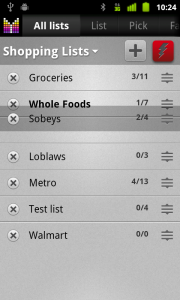 To remove a shopping list, just go to All lists –> long-tap a shopping list row –> select Delete from popup-menu. For more details please see Manage shopping lists User’s Guide. How do you delete an item off of All Lists. I don’t use Safeway and would like to delete it. I use Sams Club, added it, is great. Thanks…..
Hi Jim, thank you for your question. 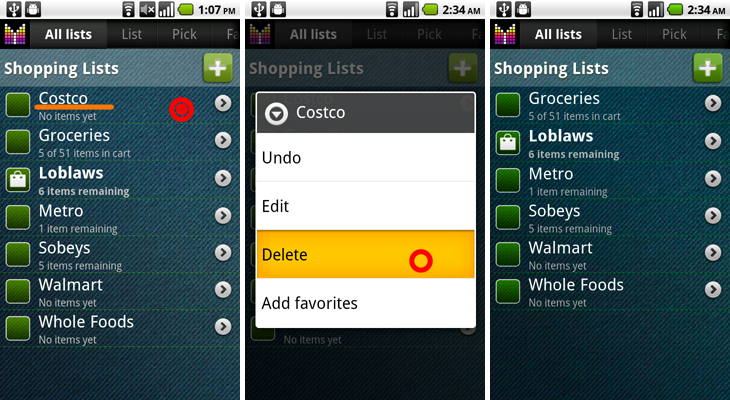 To delete a shopping list, just long-tap its row and choose Delete. 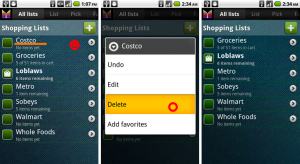 Please see Delete shopping list section for more details. Dale, thanks so much for your feedback. I really appreciate it. Come to think of it, if you decide to have the app save expiration dates, you might as well have it send a text a day or two before things start growing. Would it be possible to add a shelf life field to the item database? That way when an item is purchased, the app could calculate its expiration date. 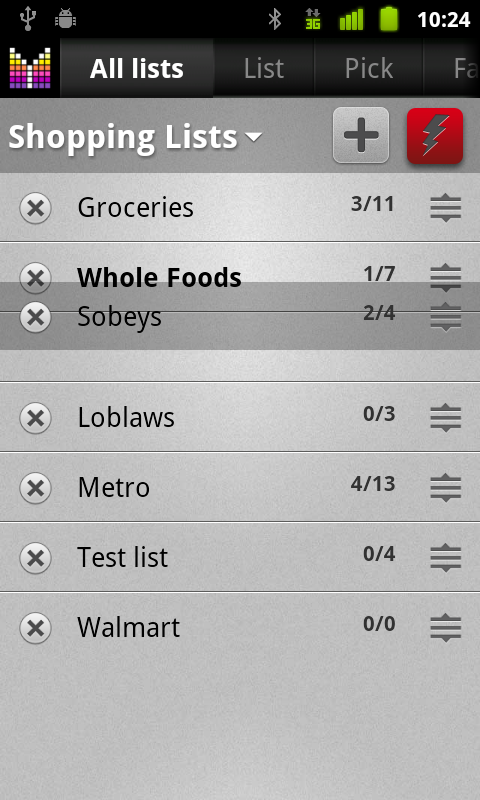 A menu selection could then display a list of items with approaching expiration dates. Items with the nearest expiration date would appear at the top of that list. This could reduce food waste and cut down on the number moldy items you discover in the back of the refrigerator. Dale, your description of the feature sounds like “Pantry manager” planned later this year. Anyway, thanks for sharing your vision with us. I also find no use for master lists. Each store has a different price, different quantity, and different brand, for each item. I want to keep items completely separate, so I have to unlink each item as I enter it, and I have to re enter the item for each store. It would be great if I could just select an item from a master list, and then edit it to fit the store. The next best thing would be if I could copy items from one list to another. For instance, I could take my entire spices section from an existing store and copy it to a different store, in a different aisle. I’m guessing this will be possible in the web app, so maybe that will solve my problem. So when will the web app be available? Hi Dale, thank you for you considerations. Kindly note that ability to assign items to different stores is planned later this year. We also consider copying multiple items between stores down the road. As to web app, please see access details on our twitter. However, please be aware that it’s a very basic web app which allows simple adding/editing of shopping lists pushed from device.